In his great documentary The Century of the Self, Adam Curtis explores topics such as consumerism and social control of the masses, but at its heart it is an exploration of collectivism and individualism. It describes the second half of the 20th century as struggle between collective ideals, and the consumer as the ultimate expression of the individual self. The 21st century is shaping up to have a different type of struggle, and it is that of how our individual and collective selves navigate technological intermediation. It is trite to point out that the Internet has changed society, but the biggest impact to our daily lives is actually not the network itself, but the devices that connect us to the network. The smartphone has come to change us in ways that we did not foresee, and the way in which we continue to use the technology to communicate with others may have more lasting effect than anything else in the past two decades. I just came back from holiday in Costa Rica, and while I spent a good portion of my vacation lying on the beach or hiking through national parks, I noticed something that had never happened to me before while on vacation: even in the most remote parts of the country, be it at the canals of Tortuguero, the cloud forest of Monteverde, or the beaches of Guanacaste, I was almost always carrying my phone. This may not seem odd in itself, but I was really shocked by just how difficult it was to completely forego the smartphone even if I tried. We had made a conscious decision to minimise Internet contact for the duration of the holiday, and I initially thought that it would be easy to leave the phone at the hotel as I have a digital camera. But as my watch ran out of battery, the phone became vital for keeping time, and also for mapping and GPS functions. Then there were other uses: the nifty panoramic view function, the need to check places to eat and visit on TripAdvisor, looking for instructions on how to get to the most beautiful hidden beach in Costa Rica, and the occasional post to Instagram and Facebook. My attempt to disconnect was easily defeated. And the more I was ashamed of my failure to stay offline, the more I noticed that other people were similarly attached to their phones. This is not so surprising in itself, as the mobile phone has substituted digital cameras for most people, so it makes sense that many tourists would use their devices to take pictures. But I started to notice that the phone was used as much more than a camera. There were the father and daughter in our hotel in Tortuguero who managed to never say a word to each other in public, using the phones to kill the awkwardness. There was the family in a restaurant in Monteverde who studiously avoided each other during an entire meal, buried in their respective phones and only talking to order food. There was the woman in Samara who spent at least 30 minutes taking selfies while friends enjoyed around her. There were the countless groups of young people walking on the beach with nothing but their swimwear and phone, stopping to take selfies as often as possible. There was the young couple in the astoundingly beautiful San Juanillo beach who took out their phones as soon as they arrived, never really caring to look up from the screen, ignoring the incredible place around them. I know that complaining about mobile phone use puts me in the same category as grumpy old men and Luddites everywhere, but please hear me out. I honestly believe that the way in which smartphones have permeated almost every aspect of our lives is a fundamental change in how we interact with one another that goes beyond the mere loss of conversation at the dinner table. 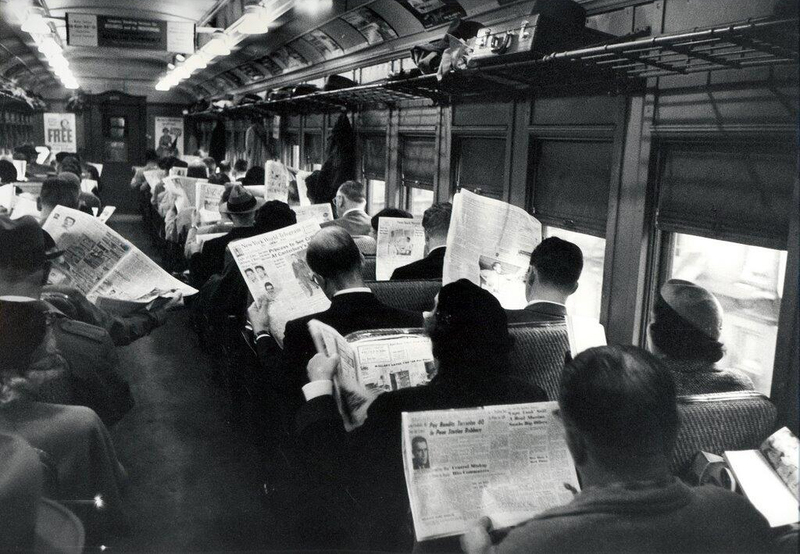 The picture of people reading their newspapers on the train is often used to imply that tablets and phones are nothing new, but there is clearly a quantum leap in engagement. It is not only reading stuff, or listening to music, the smartphone allows us to do almost everything, with communicationan almost incidental aspect of the technology. On the one hand, the smartphone has untold benefits. We have information at our fingertips, we can communicate to friends and family everywhere, we can take and send pictures with ease, sharing our thoughts whenever we wish. On the other hand, we have become addicted to curating our digital lives, generating social anxieties previously unknown. The wish to document every aspect of a life with selfies is an alien concept to me, and it seems to speak of vulnerabilities that we are starting to comprehend. But the most interesting aspect for me is whether our social media obsession makes us more connected, or more isolated. The common understanding of social media is that it allows us to talk to each other in different ways, making us more connected and bringing us together. Having friends accessible on text, Snapchat, Twitter, Facebook, Whatsapp, Yik Yak and whichever other technology you can think of is supposed to make us more connected, but it would seem to enhance the need to create a false digital identity. We are connected, but only show a fake and idealised version of ourselves that does not really exist. I have long suspected that nobody really likes my holiday pictures on Facebook, and when I post one they really secretly hate me. So instead of creating communities, social media could be isolating us more and more. Hell is other people’s walls. You try to assert individuality through the imposition of the selfie on the world. What matters is not the actual place, but that you can turn the phone and prove that you were there. An optimist’s view is that the technology really is connecting us, making us feel closer to other people. 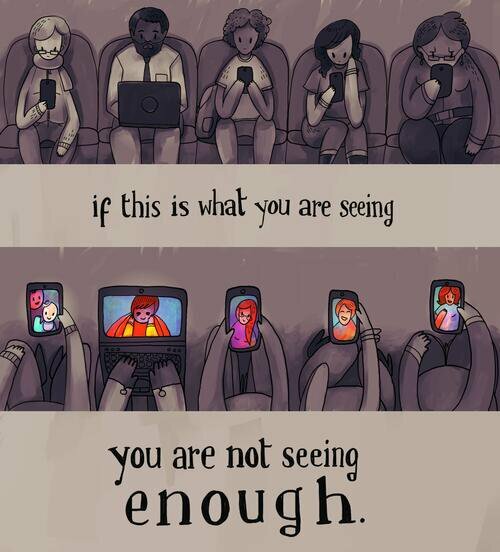 The pessimist view is that we are isolated, islands lost in front of a screen, oblivious of the world around us. You don’t need to engage with your surroundings when you visit a new place, all you need is to have a clear view for the perfect selfie. You don’t need to support a cause in real life, just sign the petition and share it to your friends on social media. The digital consumer is the ultimate island, forever alone, no matter how many likes you get. I hate to admit that I share the pessimist’s view. There is no solution in sight short of complete digital detox, people will not give up their smarphones easily. They are too useful! Interestingly, I think that the solution may be in the technology. I have been a great believer in augmented reality, and I strongly believe that it could prove to be the solution to our self-imposed digital isolation. Devices like Google Glass get a bad rap because of possible privacy implications, yet everyone is walking around with a camera and a screen at all times. I see augmented reality devices as a less intrusive interface that would allow us to continue to engage with “real life” in real time, but permitting us to maintain the useful benefits of connection. Need a map?, there it is at the corner of your sight, no need to look down to the screen on your hand, just follow the directions. And the greatest advantage of augmented reality devices is that they could send the selfie back to the fiery chasm from whence it came. One can always dream.